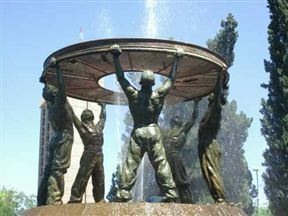 The Diggers' Memorial fountain in the Ernest Oppenheimer Gardens was erected in honour of diggers past and present. The gardens are a memorial to the late Sir Ernest Oppenheimer, a mining magnate who was the first mayor of Kimberley. Diggers Memorial is 2.1km from the centre of Kimberley , the nearest airport 5.7km (Kimberley Airport).